RelayHealth provides clinical connectivity to physicians, patients, hospitals and more using innovative health information technology. Connect with us today. Send claims electronically straight from Medisoft in ANSI format without having to leave the system. No more using an outside website or uploading claims. To check each claim to make sure it meets ANSI 5010 requirements. Claims are also labeled passed, warning, or error allowing you to fix any problems before the claim is sent. ERA downloads right into Medisoft giving you control over which line items to post and what codes to use. This lets you receive ERA's up to a week sooner than paper EOB's. Perfectly integrates between your Medisoft or Lytec and the clearinghouse. Keeps all of your claims in one spot inside Medisoft or Lytec without having to use an outside website or download/upload. Check and verify patient eligibility without leaving Medisoft or Lytec. Save a copy of the eligibility response in a patients chart. Get paid from the payor usually 4-10 business days from the payor instead of 2 months. This is the quickest time possible to keep your cash flow where it should be. 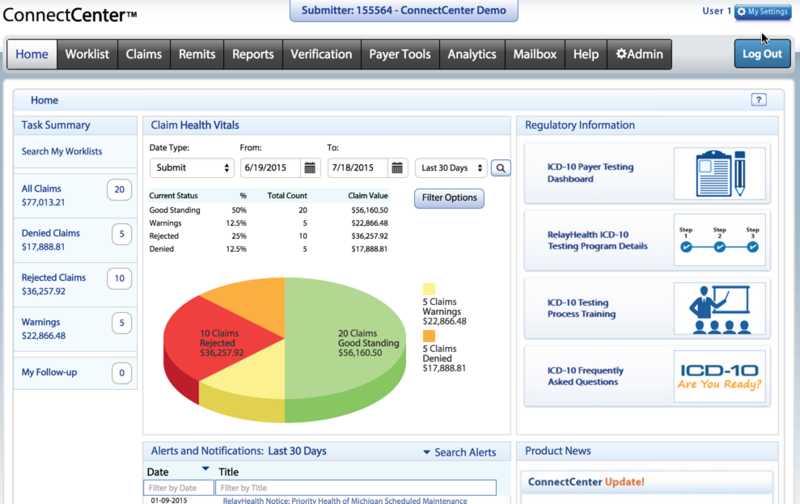 Get an immediate progress report for RelayAssurance EDI through the Connect Center Claim Health Vitals Dashboard. It provides your team the dollar amount and number of claims in good standing, pending, rejected or denied. 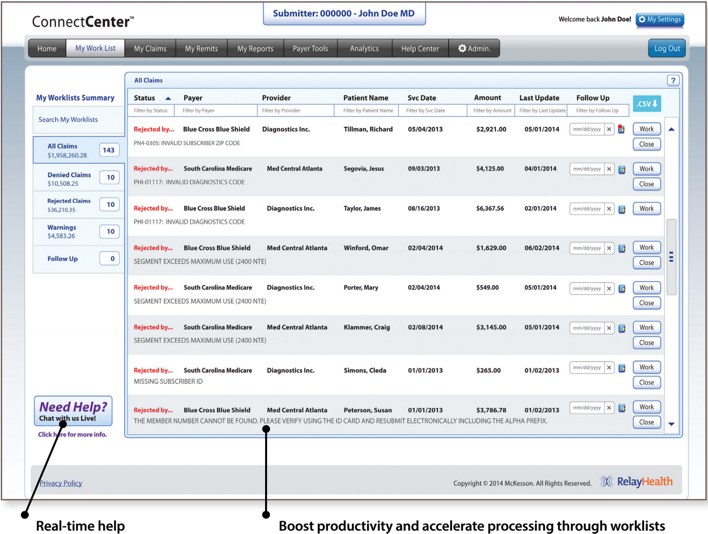 It allows you to focus your time on the true claim issues and expedite your workflow. Form views highlight any issue RelayHealth has found when validating your claim. Hyperlinks quickly take you to claim issues and provide detailed error information to help you make corrections. 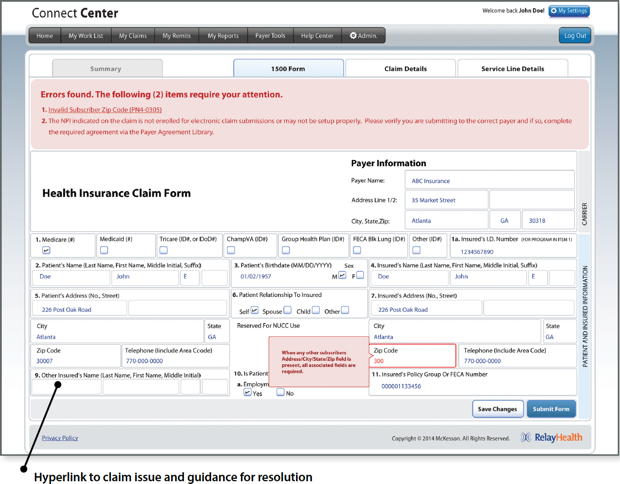 You can address claim issues online within Connect Center. You also have the option to quickly re-validate the claim and submit it back through RelayHealth for processing. Connect Center’s claim management solution provides you all the tools you need to see, track and manage your claims in a simple, intuitive, online solution. Keep up-to-date with current information on payers and other issues that may cause delays in processing. Notifications related to the payers that process your claims are pused directly on to your dashboard. Keep staff focused on the most productive work thorugh Connect Center work flow management. Work lists help organize tasks in a meaningful way and may eliminate the need for users to filter through claims in good standing that can pass through untouched. Extensive search features help users find claims and remittances and specific data with-in lengthy reports to quickly compile the information needed for efficient follow up. Setting reminders for timely claim follow up helps clear work lists of these future tasks until the designated follow up time. Interested in Switching to RelayHealth EDI?